Here are some slices of information about the pizza giant's business. It's the global market-share leader in pizza, and its 15,000 locations churn out 2.5 million pies per day. But there's plenty about Domino's Pizza (NYSE:DPZ) that investors might not know. Below, we'll highlight a few facts about this delivery giant that might surprise shareholders and pizza fans alike. Pizza has been around for well over a century, but there's nothing old-fashioned about Domino's business model. Over half of its sales are booked through digital channels, for example, and that rate reaches over 60% in the core U.S. market. The chain has a strong track record for leading in the e-commerce space, too, with an ordering platform that's spread far beyond its own app to include devices like Amazon's Alexa products and the Apple Watch. Recent offerings include a new Hotspot program that extends delivery options to places without addresses, like parks, sports fields, and beaches. And Domino's is currently testing drone and autonomous-vehicle delivery offerings. So investors can expect many more innovations in the pizza industry. Many people know that McDonald's makes most of its profits from rent and franchise fees rather than through food sales. Domino's operating setup also shields its business from those low-margin transactions. In fact, over 60% of the company's revenue comes from ingredient sales to franchisees from a supply chain that last year delivered 525 million pounds of dough to its pizza shops. Domino's business is still highly dependent on the success of its franchisees, and that's why management is doing all it can to lift comparable-store sales, or sales at existing locations. Things are looking up on that score, as growth accelerated to an 8% pace in the most recent quarter, which marked Domino's 28th consecutive quarter of growth in its core U.S. market. Since they focus on delivery and carryout, Domino's stores are small and easy to launch and maintain. That efficiency has helped make it one of the fastest growing restaurant chains in the world. In fact, the chain is on track to cross 15,000 locations this year, up from 10,000 in 2012. Executives believe there's a long runway for growth ahead, with space for an additional 3,000 locations in the U.S. and more than 5,000 in just its top international markets. Domino's is the market share leader in pizza delivery, but has a smaller share of the industry's much larger carryout segment. The company is targeting that niche from two angles. First, it is remodeling its restaurants to make them more attractive for customer visits. Second, Domino's is blanketing regions with more locations to reduce a customer's travel time to six minutes or less. 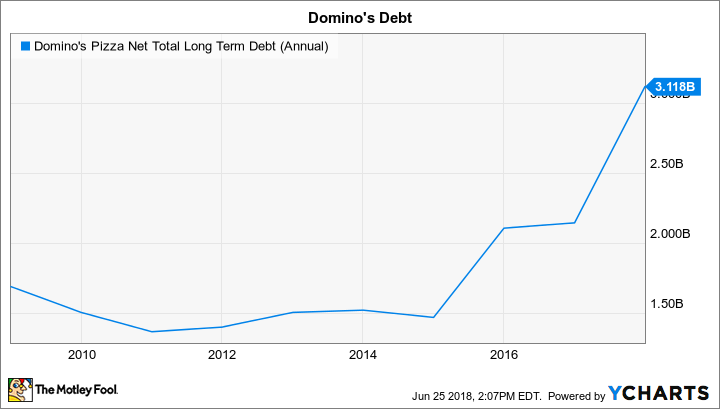 The pizza chain makes heavy use of debt, with loans totaling over $3 billion as of the end of March, or almost one third of its $10 billion market capitalization. Its debt-to-earnings leverage is near the top end of management's goal, but executives aren't worried about the burden. Interest payments are high but manageable, after all. They're projected to be about $145 million this year, compared to operating earnings of over $500 million. DPZ Net Total Long Term Debt (Annual) data by YCharts. These loans are funding an aggressive expansion strategy that has allowed profits and revenue to soar over the last decade. As for the next 10 years, investors are likely to see the chain continue its push into the digital channel while blanketing the U.S. market, and international geographies, with its delivery-focused stores. That strategy forms the basis for management's long-term target that calls for overall growth of roughly 10% per year, split about evenly between a growing store base and higher sales at Domino's existing locations.